NEW FEARURE -- Instead of showing you individual images of all the sets, which was basicallly what you would see if you search for all 2018 sets, I instead have tried to create something that is, as far as I know, not currently available anywhere else on the Internet. Rebrickable THEME POSTERS. Each image you see in this review is a thumbnail of a much larger poster, which will open in a new browser tab when you click on the thumbnail, and can then be saved to you harddisk the usual way. All these poster are 6,000 pixels wide, which seems to be the preffered resolution for print shops, and, depending on the number of sets on the poster, up to 10,100 pixels height. These posters are LARGE!. The size of the files ranges from 2 MB to 7.8 MB, so with a slow Internet connection, they might take some time to download. I am still developing the software that generates these posters, so if you have any special requests, remarks or comments, please post a comment at the bottom of this review. I am really interested if people like these kind of poster, and, if so, what other posters might be interesting to create. While the LEGO Architecture theme was introduced in 2008, the Skyline sub-theme is a recent addition which started in 2016 with Venice, Berlin and New York City, followed by Sydney, Chicago and London in 2017. 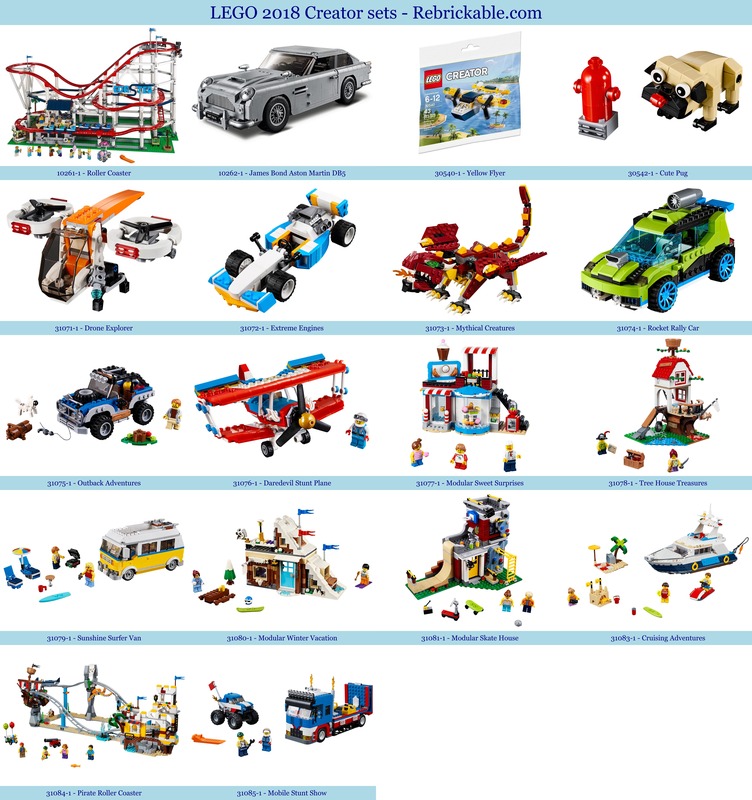 In 2018 LEGO will add at least two new sets to this sub-theme, Las Vegas and Sjanghai; the Las Vegas set was postponed due to an incedent in one of the depicted buildings, but has now arrived. 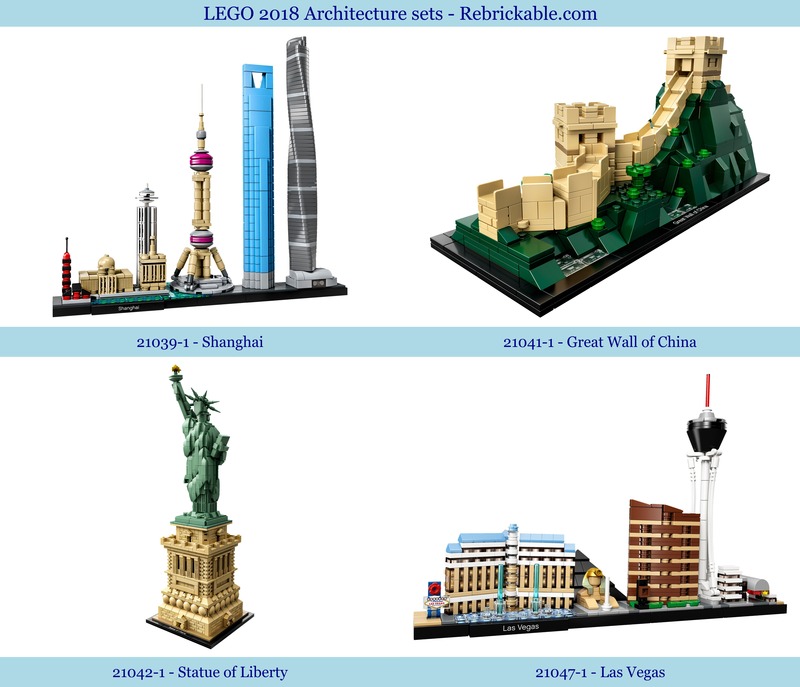 The Great Wall of China and the Statue of Liberty, both classic Archtecture sets, have also been released, bringing the total for 2018 at four sets. 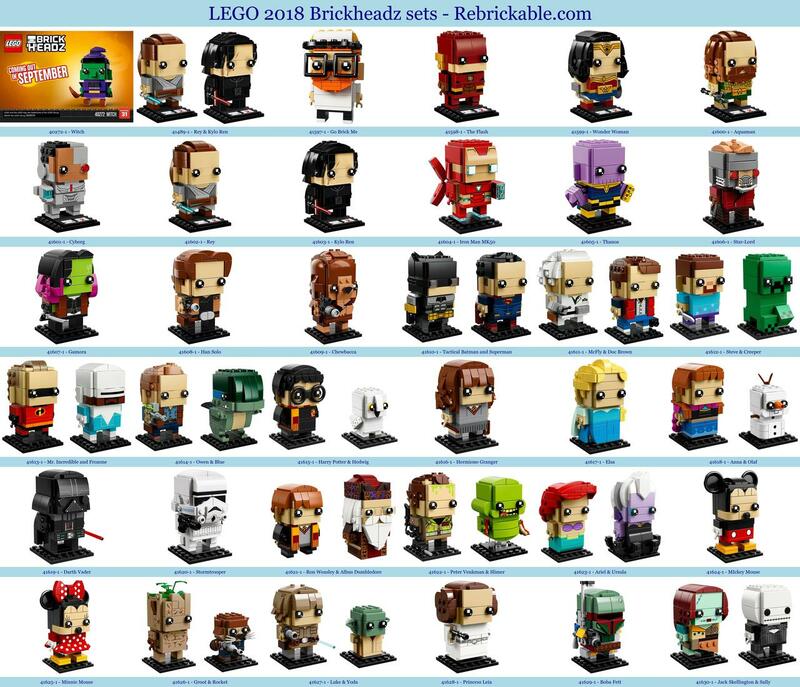 In the second year of their existence, these buildable characters made out of LEGO bricks have clearly proven to be popular, and so seven new Brickheadz sets have been released in January, including a combination set. Set 41597-1 (Go Brick Me) allows fans to build their own likeness in the BrickHeadz style. Together with Seasonals and Value-Packs 37 sets now available. The Classic theme was introduced in 2015 as a continuation of a long line of free building brick collections like Basic, Universal Building Sets, Freestyle, Bulk Bricks and Bricks & More. 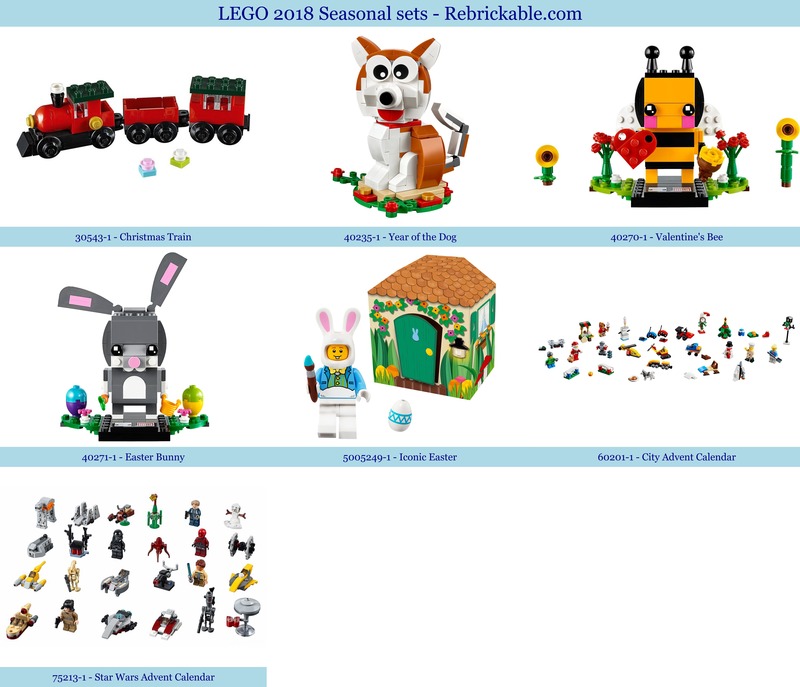 Whereas, in earlier years, different color groups were sold as different sets, this year most Classic sets might have a little less variety in types of bricks, but they do contain an unprecedented variety of colors. Seven new Classic sets have been released in January 2018. 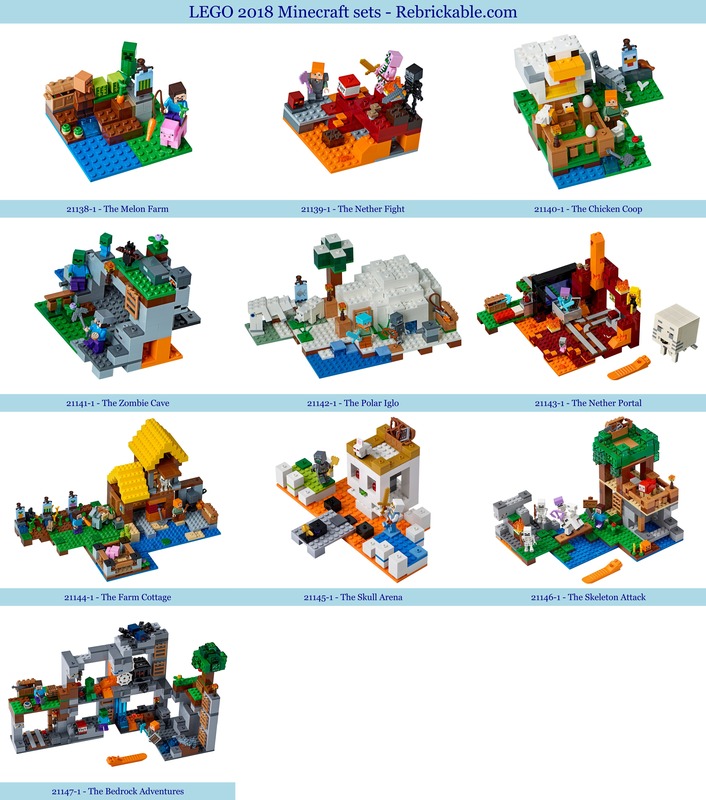 The new Building Bigger Thinking sets and some of the Exclusives can also be considered Classic sets. 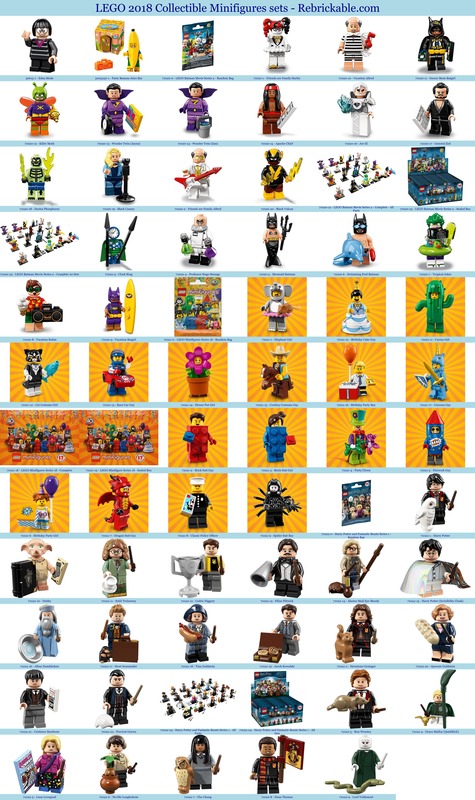 This year has brought us the LEGO Batman Movie Minifigure Series 2, the Harry Potter and Fantastic Beasts Series 1, and the LEGO Collectable Minifigure Series 18, plus a number of individual releases. 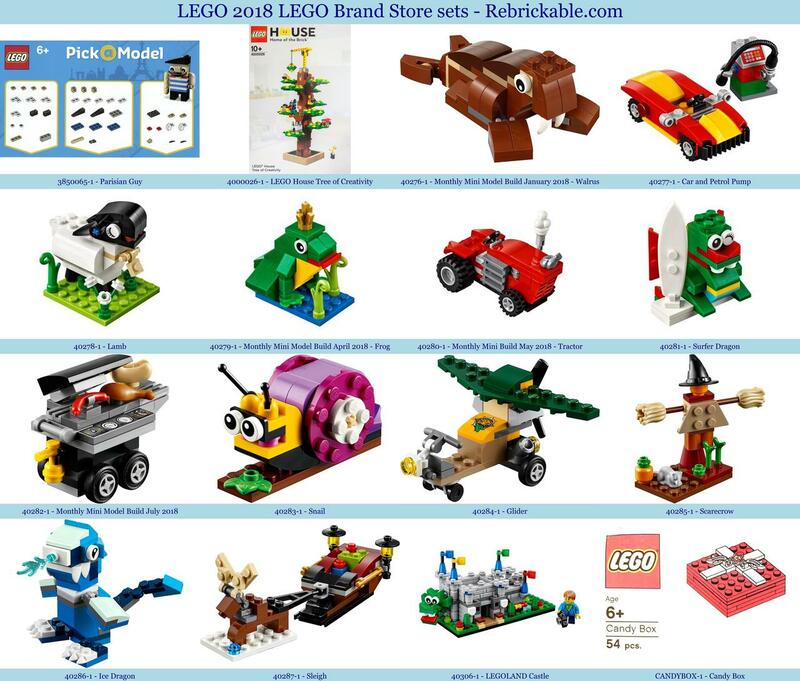 The LEGO Creator line was introduced in 2001 and since 2006 a majority of the sets are "3 in 1" sets, which can be assembled into 3 different models; basic, medium and expert. 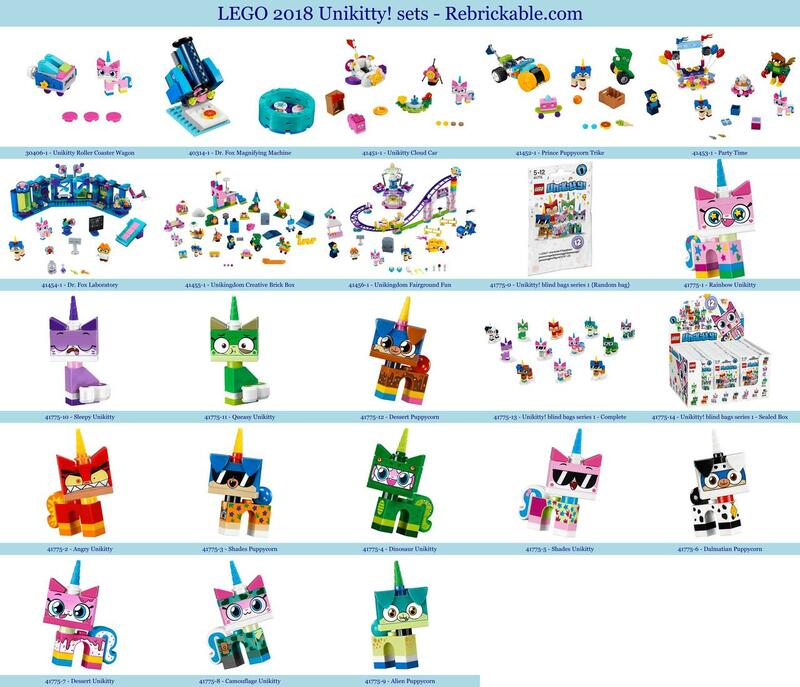 In total some 500 Creator sets have been released. This year the Creator series featured two Roller Coasters, an Aston Martin DB5, and a dozen or so smaller sets. Disney Princess was released in March 2012 using DUPLO parts and figures. In 2014 new series of sets for girls aged 5-12 used System bricks and mini-dolls. Since then the princess sets have been available in both scales. 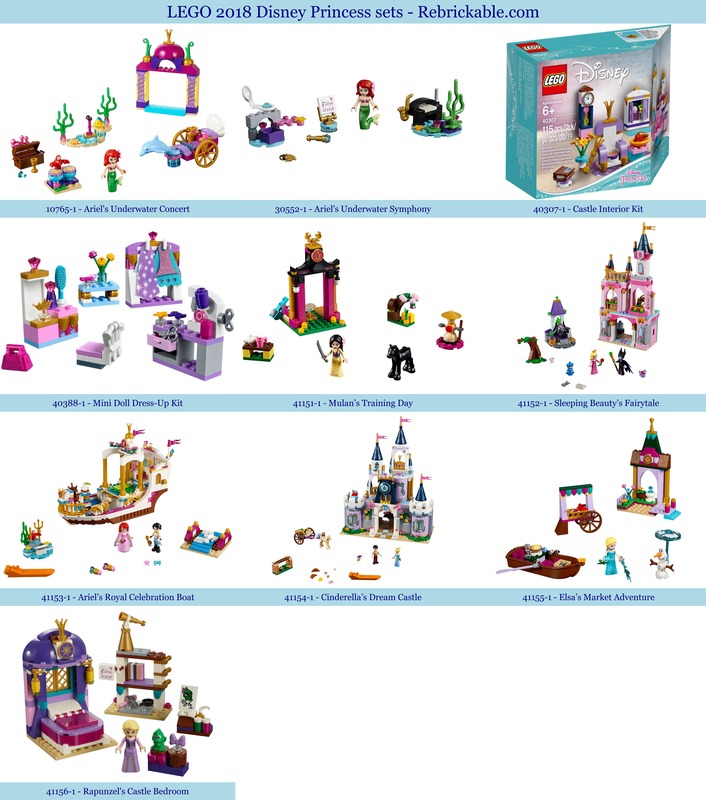 Ten new Disney Princess sets have been released, together with four sets within the DUPLO line. Duplo bricks were introduced in 1969, and were called Preschool between 1977 and 1979, and Explore in 2002. 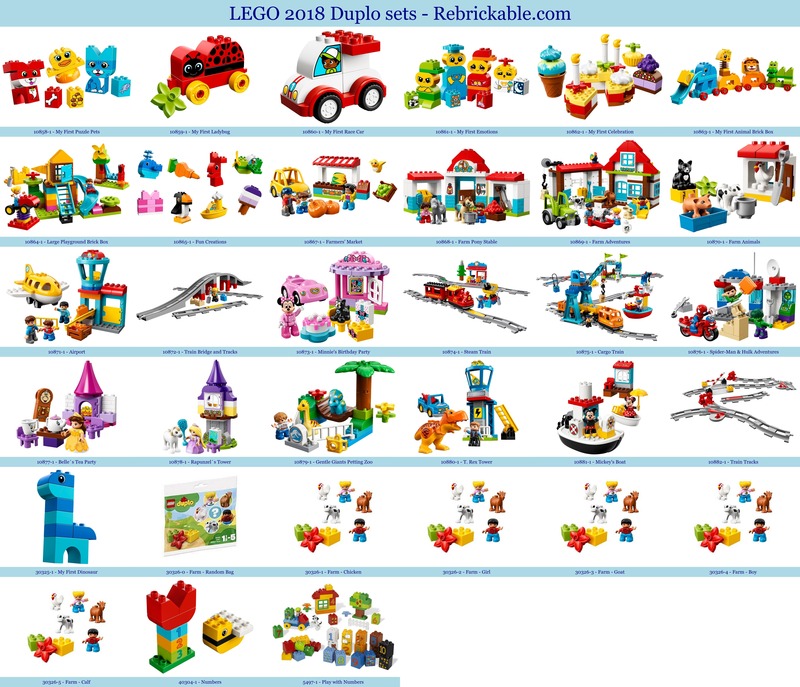 With the success of the Friends line, DUPLO added more female characters and girl based sets during the last six years. 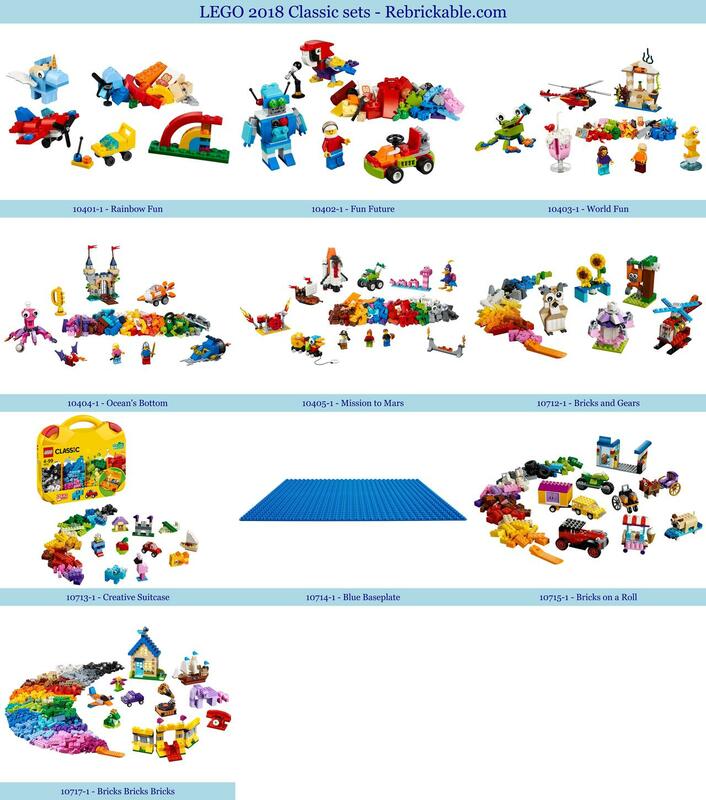 For 2018 twenty-three new sets have been released within the DUPLO theme, and another two within Jurassic World Fallen Kingdom. Elves is a theme that was introduced in March 2015, revolving around four elves who can control elemental powers. Seven 2018 Elves sets have been released. The Friends theme was introduced in early 2012, although some Friends sets were already available in late 2011. 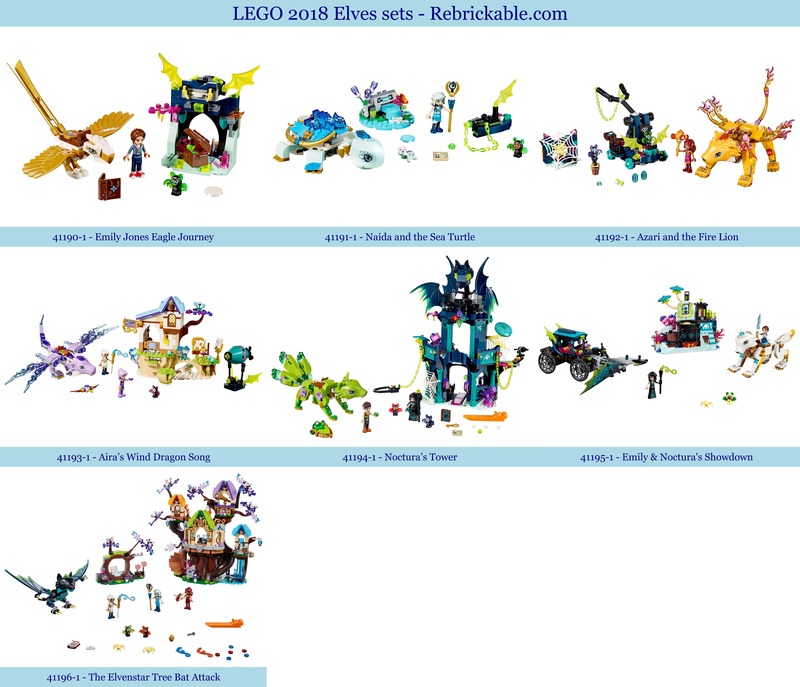 The theme replaced Belville as LEGO's main "girl" theme. 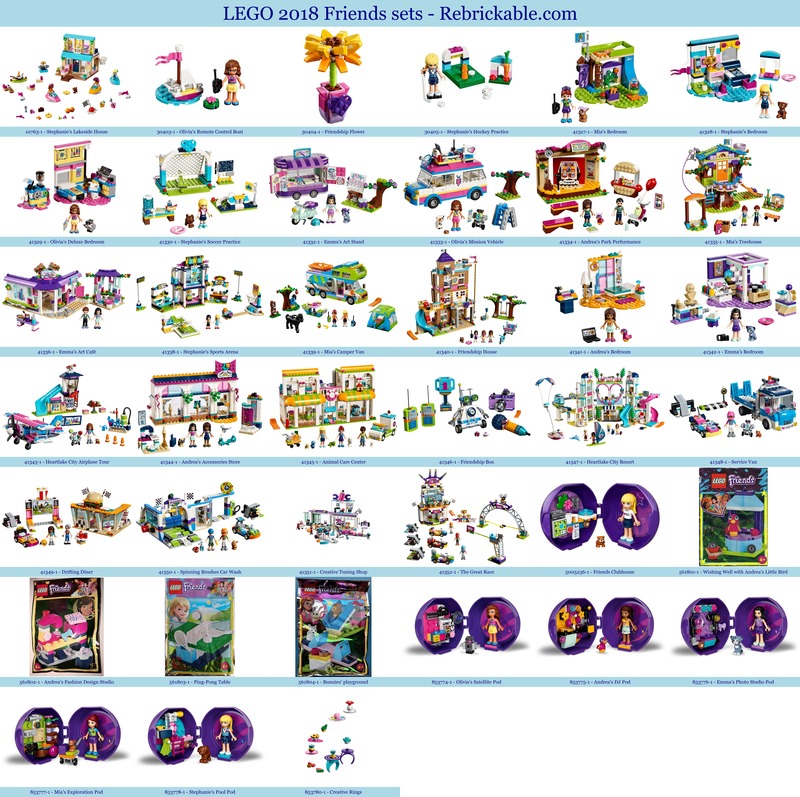 In 2018, a staggering fourty new sets for LEGO Friends were released (and another two within LEGO Juniors). 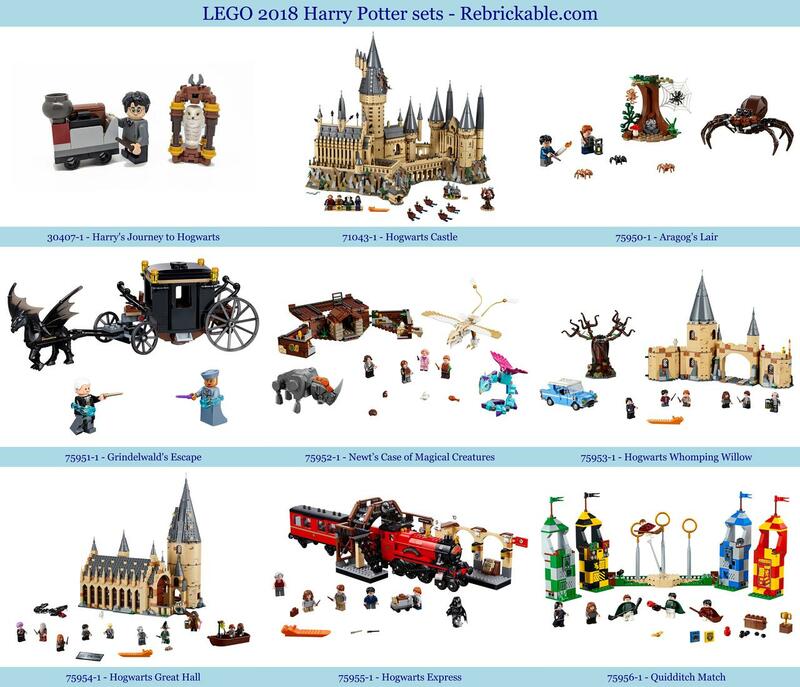 Great new for all those Harry Potter fans: coinciding with the release the second Wizarding World movie Fantastic Beasts: The Crimes of Grindelwald, which is scheduled for 16 November 2018, LEGO is restarting the Harry Potter licency, which originated in 2001, as one of the LEGO Group's first major licenses. Following Fantastic Beasts and Where To Find Them, this year has brought us nine new Harry Potter sets. But wait, there is more. There is also a new Harry Potter Collectable Minifigures series. Lego Juniors is a theme designed for children of 4 to 7 years old, serving as a transition from DUPLO to Classic and Creator. Juniors was introduced on February 14, 2014, as "Easy to Build", following "Bricks & More" which was in 2009. Junior sets use larges bricks to make models both realistic and easy to build. 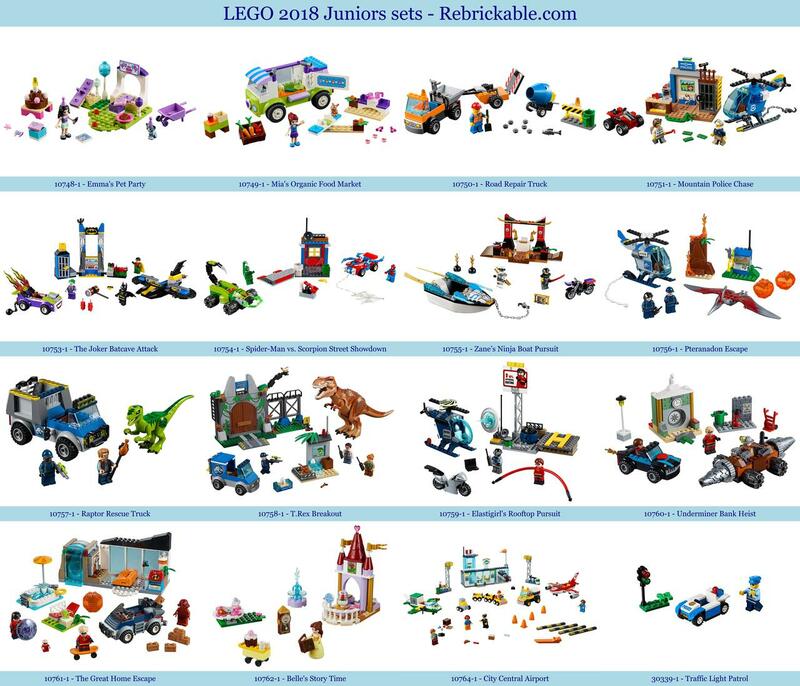 In 2018 we get two Friends sets, two Superheroes, three City, a single Ninjago, and three Jurassic World Fallen Kingdom Junior sets. 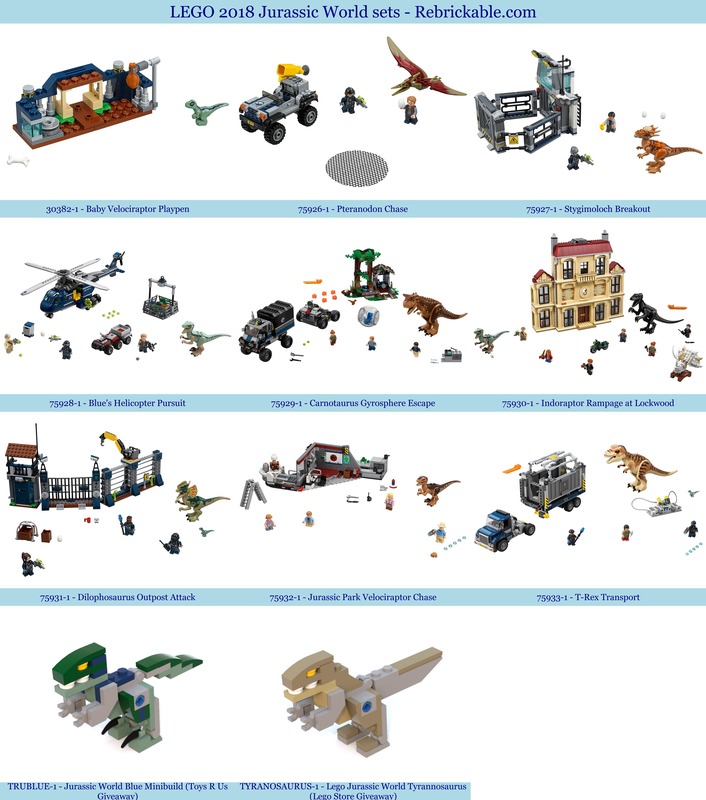 In support of the theatrical launch of Jurassic World: Fallen Kingdom, Universal and the LEGO Group have announced 13 sets in themes LEGO Systems (ages 6+), LEGO Juniors (ages 4-7) and LEGO DUPLO (ages 2-4), and a Walmart/Toys 'R' Us exclusive BrickHeadz set. More sets and information were unveiled at New York Toy Fair in mid-February. Based on the sandbox video game and introduced in June 2017, the Minecraft line of 31 sets has been extended this year with another ten new sets. 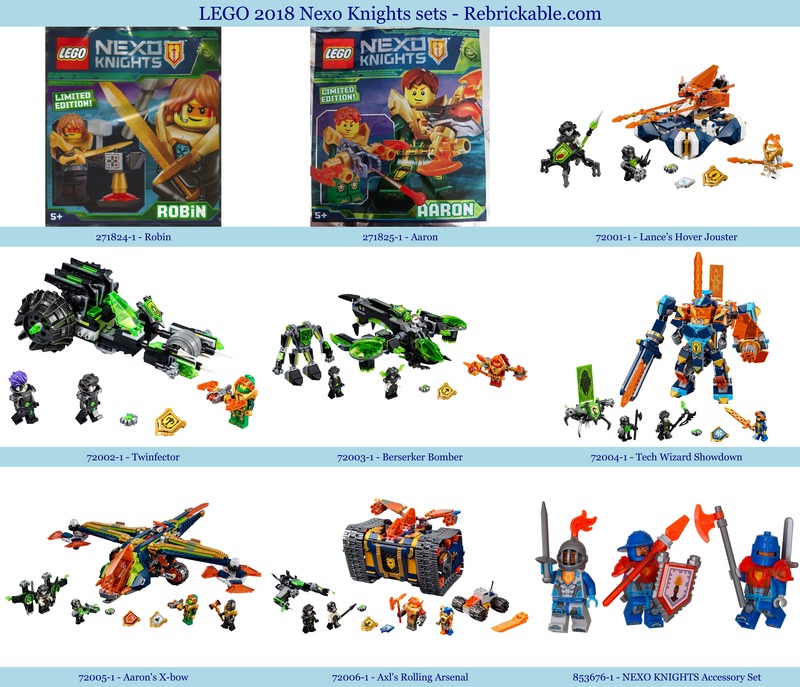 At the Nuremburg Toy Fair LEGO announced that the Nexo Knights theme will be discontinued at the end of this year. There will be no new sets during the summer, with a last farewell wave in December. 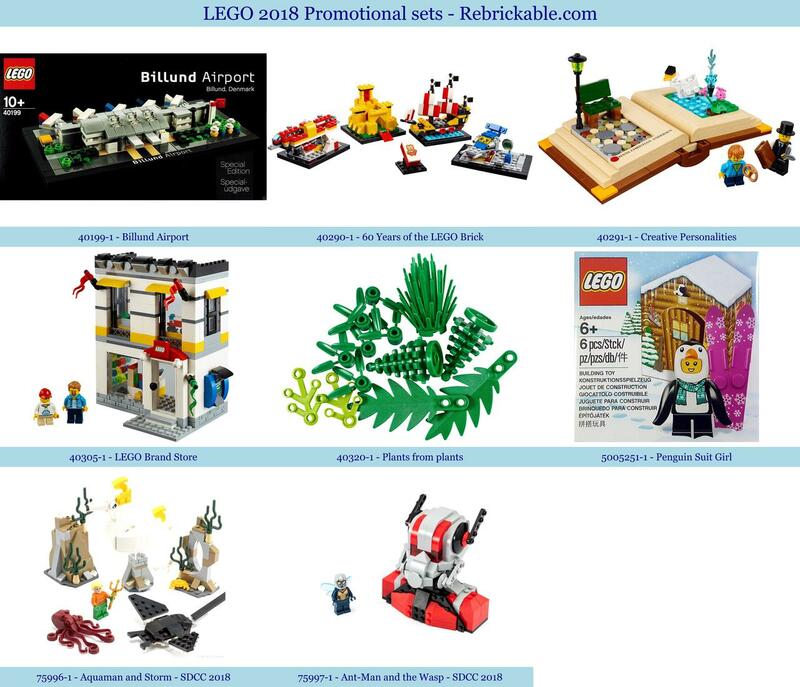 These are the last nine sets that have will been released. Ninjago Masters of Spinjitzu was introduced in January 2011, intended to be replaced by Legends of Chima in 2014. Instead, the two themes both existed simultaneously until Legends of Chima was discontinued in 2016. Together with City and Star Wars, LEGO Ninjago is one of the three most popular themes for 2018 over thirty new sets. Set 70654-1 (Lightning Dragon) will be Boost enabled. 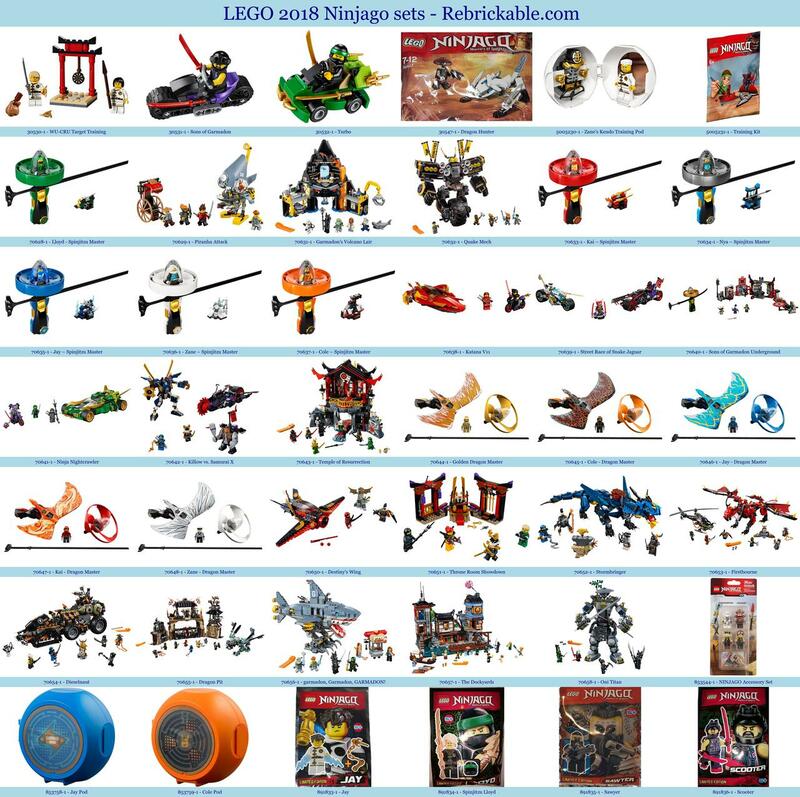 Set 70657-1 (City Docks) has been announced as a complement to the gigantic Ninjago Movie 70620-1 (Ninjago City) set. City set 30358-1 (Dragster) was the LEGO shop promo for January, the anniversary promotional set 40290-1 (60 Years of the LEGO Brick) was free with purchases over $125 in February 2018. 40276-1 (Walrus) was the LEGO Brand STore Monthly Mini Model Build for January 2018. Introduced in March of 2015, these semi-accurate models of racing cars belonging to existing brands are gaining more and more fans. 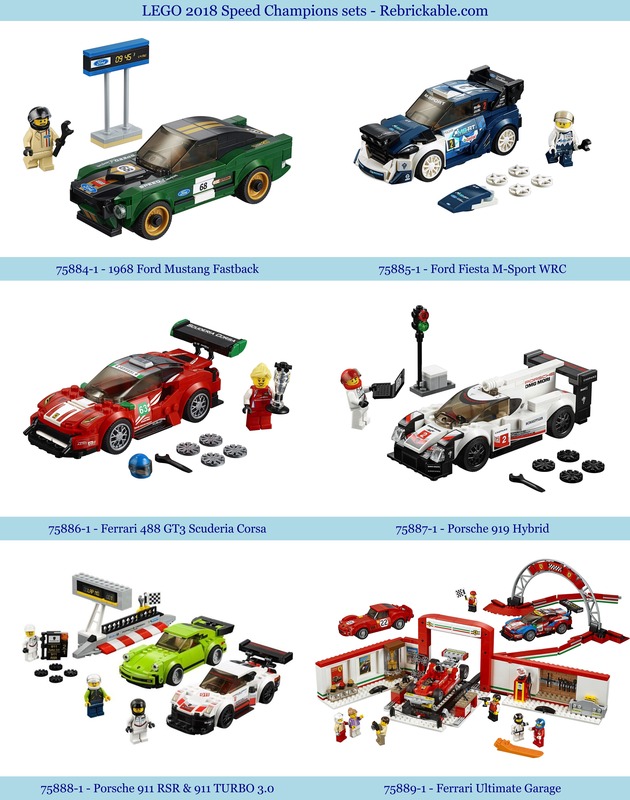 Six new Speed Champions sets have been released in April 2018. 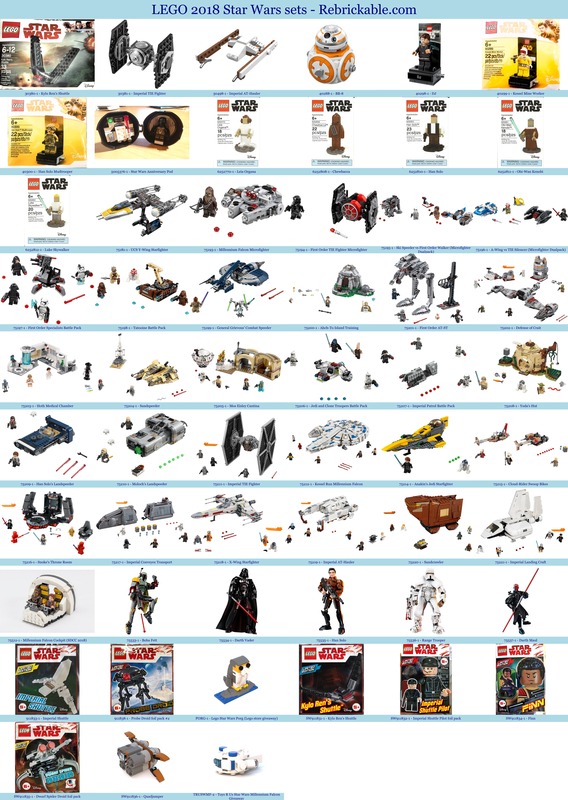 From the humble beginning in 1999, and three licence extentions with Lucasfilm (the current licence for LEGO Star Wars will expire in 2022), the LEGO Star Wars line was expanded this year with at least 39 new sets. 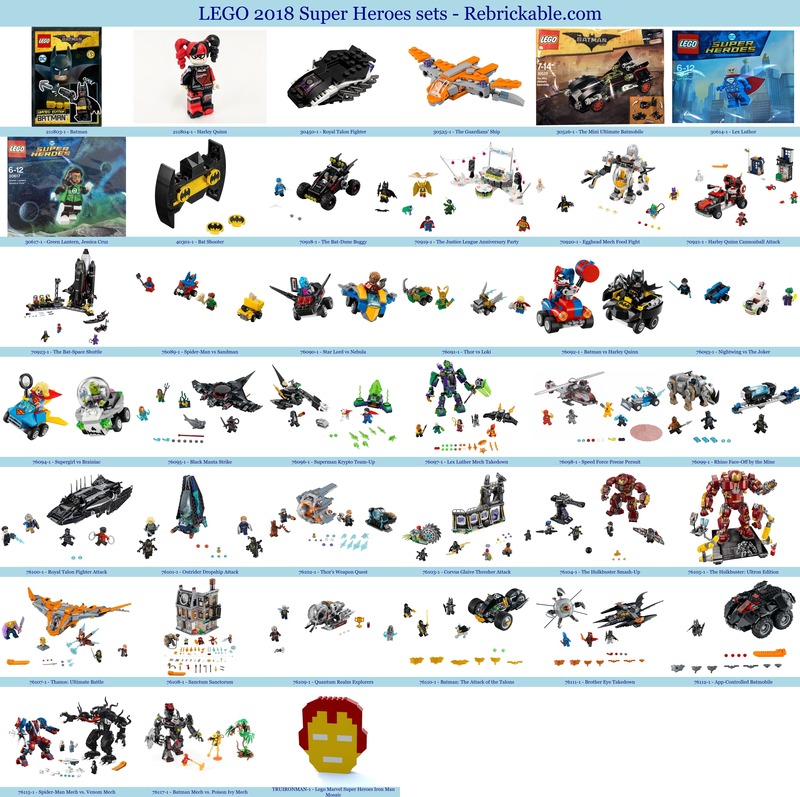 Three new DC Comix Super Heroes sets and three Mighty Micros sets are available, seven Infinity War - Hulkbuster sets have been announced, and another three Batman sets have also been announced; one of which, the new 76112-1 (Batmobile), will include the new Power Functions 2.0 with Bluetooth connectivity, a new battery (and seemingly a different power interface) with App control. The Power Functions 2.0 system is also included in the two new Train sets. Commemorating the 60th anniversary of the brick, as well as LEGO's longtime retail partnership with Walmart, they're are offering three exclusive sets in vintage 1960's style. After 26 years and about 830 sets, LEGO Technic is still going strong. 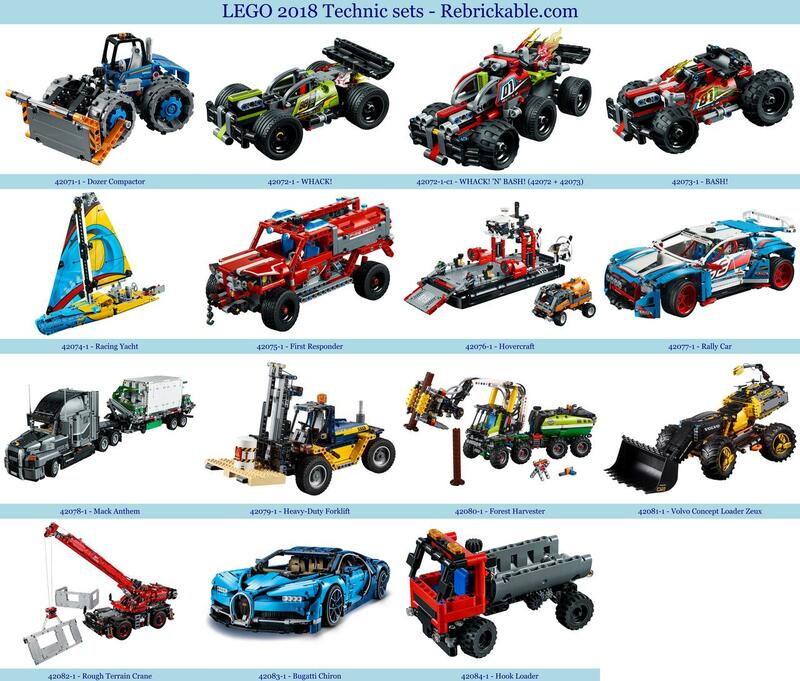 Nine new Technics sets have already been released, and LEGO Technic 42083-1 Bugatti Chiron has been released on July 1st. Two new sets within the new Powerpuff Girl theme are already known. Set 41287-1 features the minifigures of Bubbles, Princess Morbucks, and Octi, and 41288-1 features everyone’s favorite primate baddie, Mojo Jojo, Blossom, Buttercup, and a brick-built version of the Donny the Unicorn from the new series. 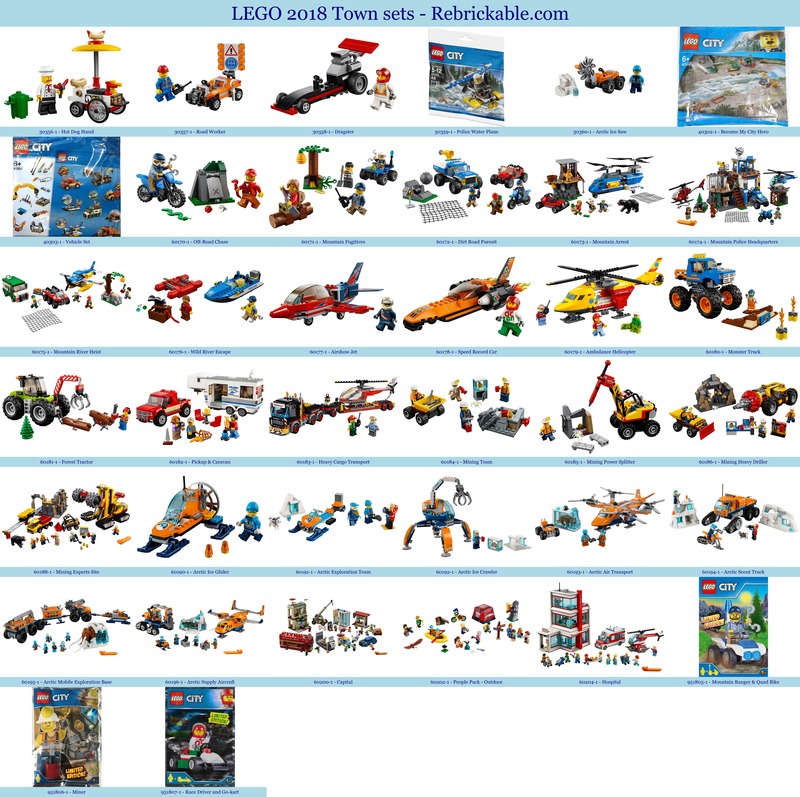 One of the longer running LEGO themes, the longest if one includes the Town related System sets, introduced in 1977, or even the earlier 1958 Town Plan; within the LEGO City theme, introduced in 2005, thirt-four new sets have been released, and yes, we have added the polybags. Set 60194-1 (Arctic Exploration Truck) will be Boost enabled. 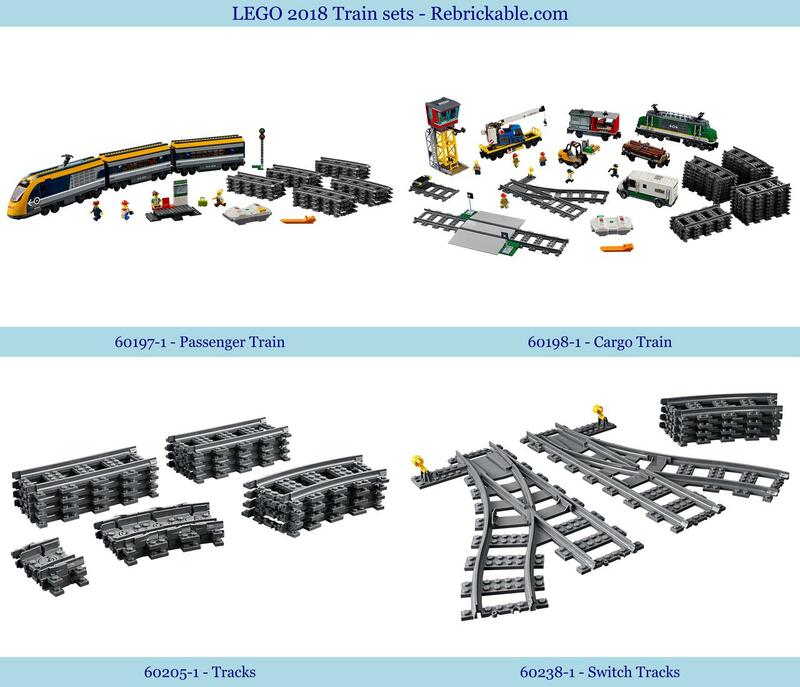 Three years after 60098 (Heavy-Haul Train) LEGO has released two new train sets this year, both using the new Power Functions 2.0 system with Bluetooth connectivity, a new battery (and seemingly a different power interface) with App control. The Power Functions 2.0 system is also included in a new DC Comix set. Listed under Space is one of the three Lego Store giveaways from July 2018. They were mystery boxes with no instructions, but does anyone have the inventories of the other two sets? Has anyone tried to calculate the cost if one wanted to purchase all of the sets released each year? Before there was Power Rangers, there was Voltron Defender of the Universe! Glad to see this set finally make it to Lego. I thought this set came through the Lego Ideas? My son (age 4) has just started to get into legos. I'm excited for the release of the new sets to help him expand his collection! A good place to start would be either Classic theme (lots of bricks, many colors) or the new Building, Bigger, Thinking theme (with minifigure). If your son can't wait, try 10706-1 / 10707-1 / 10708-1 / 10709-1. Best value for money. Thank you Simon! Santa brought him the 10704 Creative box for Christmas, then My Mom & Dad also purchased a large creative box for him for odds & ends, & he is having a blast! He loves the City Police sets, we just have the smaller sets & add ons. I don't wanna go too big just yet as age wise he is not ready. Are there any smaller category specific sets you recommend such as fire trucks, etc? He has the Beach Fun pack & Fun In the Park sets, but I need some ideas for his birthday in January. Most important question, I think, is this: is your son a builder or a player? When I was young (many, many years ago) I definitely were a builder; I didn't care about playing with the things I made, I just wanted to show them (to anyone) and then take them apart and start again. My own daughters, however, when they were younger, they were only interested in role-playing; using minifigs and Fabuland figures, combined with all kinds of other stuff, wooden doll-house furniture and such, they would start telling themselves stories, and never ever cared about building. I used to think this was gender related, but nowadays that is politically incorrect, and perhaps, rightly so. In any case, my advice would be to watch carefully as he plays, and follow his interests. Oh, and don't overload - a small box every few weeks works much better then a large box every few month. If you want to talk some more, why not register at the forum? Hope this list helps! 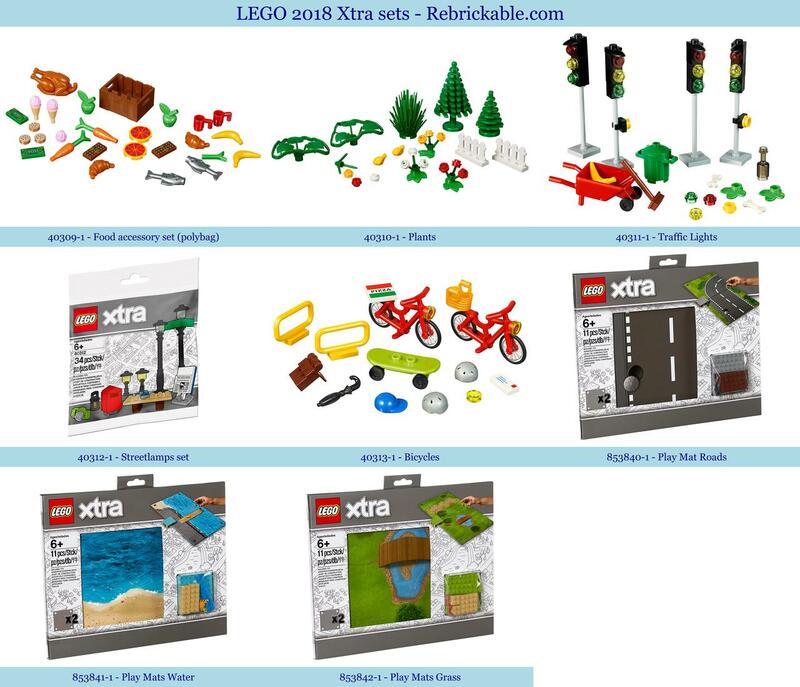 According to eurobricks their release date is February 26, 2018. Merry Christmas! 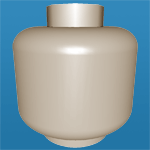 The images for the SC sets are now on brickset﻿, so you can add them here. It's still a toss up if there will be any, but while you read through that, you will get the feeling there wont be. I'd love to see some new trains too. Especially as LEGO seems to have just retired the heavy haul train and the cargo train also seems to be heading for retirement. The links take me to a 404 error page? I had checked them all -smile- could you give me an example? UPDATE: found five disabled sets and made them active - apologies and thanks for letting me know!